One interesting thing about an expansion that raises the level cap is that if you previously had multiple characters at the old cap, ready to jump into endgame content at a moment's notice... you suddenly don't anymore. If you're anything like me, that means that you'll find yourself repeatedly falling into traps such as: "Oh, I could bring my Sage to this operation... oh wait, she hasn't hit the new cap yet, never mind." Considering that it took me less than two days to get my main to 55, progress with my alts has been pretty slow. It took me more than a month to get a second character to the new cap, my gunslinger - which was incidentally kind of strange, considering that she was my least played level fifty character by a mile (and badly neglected), but I had got it into my head somehow that I wanted to have a ranged dps character at the cap next. A week later my inquisitor followed, and today my Sage - who used to be my "main alt" - hit 55 at last (after an awesome Lost Island HM pug where I won both the pet and the speeder off the last boss - woot). Admittedly part of my slowness with getting my alts up to the new cap is that I've simply been having enough fun with other parts of the game (such as doing endgame content on my main and making more lowbie alts), but another part of it is certainly the fact that there is no continuation of the class story. I don't blame Bioware for doing what they did, but still... if they had continued to release unique class story content for all classes, levelling all your alts to 55 would have been a bounty of riches in terms of new content. Now it just means another round of Makeb. While I'm generally quite happy to redo a lot of the quests that are shared between classes over and over again (because they are good), there is such a thing as having too much of a good thing even for me. 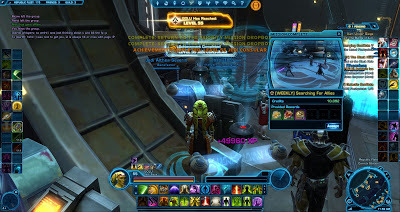 The expansion has only been out for two months and I think some of my guildies have already quested their way through Makeb half a dozen times just to max out all their alts. That's a road to burnout any way you slice it. I still haven't played through the Imperial story and have only done the Republic one twice, but even there doing the Mining Mesa a second time shortly after my original run-through already felt like a bit of a drag. Fortunately Makeb completion isn't actually a requirement for anything other than to unlock the dailies, and on how many different characters do you want to do those anyway? There are alternative ways to 55. 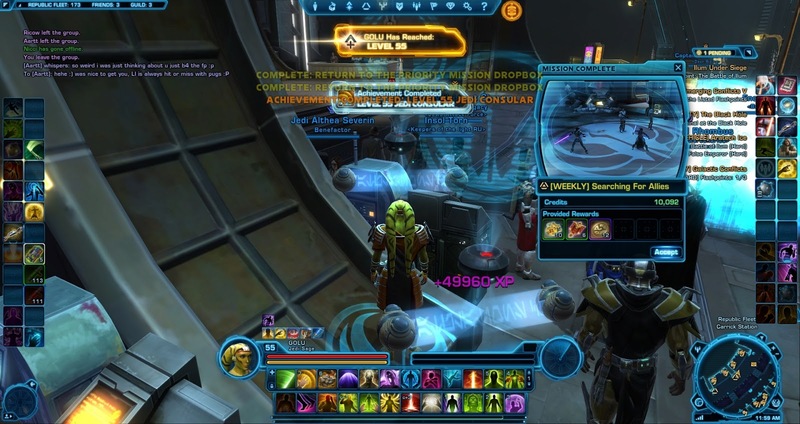 As I mentioned in my "Shinquisitor" post, that character actually levelled to the new cap purely by completing planetary quests that she hadn't done yet, in particular the entirety of Voss and Corellia. Towards the end of each planet experience gains were starting to drop off pretty sharply, but at the end of the day those quests were still good for the entirety of five levels. If you don't have any regular quest content left to do, the old dailies are a pretty decent source of XP as well. On my gunslinger I started off her levelling journey to 55 by doing the Belsavis bonus series and all of Ilum (minus the heroics) just once and it provided a pretty good headstart for the road to 55. Then there are the old level fifty flashpoints, both on normal and hard mode. These are actually a pretty amazing source of XP if you play it right... but unfortunately many players don't. I've always said that I've observed general flashpoint etiquette to be in favour of taking it slowly, clearing everything and doing the bonuses while levelling, and going for a quick run at endgame - which makes perfect sense. The problem is that for quite a few players it hasn't quite sunk in yet that level fifty flashpoints aren't actually endgame anymore. I suffered from a particularly egregious example of this when my gunslinger got into a Battle for Ilum while levelling, looking forward to a nice XP pay-off after the long wait in the dps queue... and then ended up with a group that skipped pretty much everything possible, including most of the bosses. The only "saving grace" was that at the end of the run the level fifty tank suddenly stopped and said: "Huh, I guess I could have used the experience from all those mobs... and the gear... damn, I'm still stuck in farm mode." All I can say is, if you do end up in a pug with characters that are mostly still levelling, you can at least try to make a case for doing a full run. Maybe mention the achievements for killing all the bosses too, that might pique some people's interest. Then there are the old level fifty operations of course - I wrote about using those to level up before. Good fun, good XP, good loot... what's not to love? If you don't pad your experience gains with anything else, it's kind of a slow way to level since you can only do each op twice a week at most, but it's still worth it. The only minor obstacle I've encountered is that for some reason Bioware won't allow level 55 characters to enter these old operations via the group finder (which really baffles me, because you can still queue for level fifty flashpoints, even the normal ones). This means that if you have an operations guild group of seven for example, and even one of you has hit 55 already, you can't fill the eighth slot from the group finder, which is annoying. Last but not least, there is always PvP. My Sage levelled almost exclusively through a combination of old ops and warzones, and it was quite fun to find myself back in the levelling bracket after a year or so of PvPing at the level cap. I'm pretty sure that I will redo Makeb on a couple of more characters eventually, but repeating it too many times - and still relatively shortly after release - just can't lead to anything good in my opinion. Looking at your screenshot I have to wonder whether you made any UI adjustments at all and whether you are actually comfortable healing with more or less the default setup. I took a lot of time and care to customize different UI styles that fit their respective purpose perfectly.